Now that we've been gifted 2 tickets to the World Series from the generous Marcus Lemonis, I'm excited to have this opportunity and the momentum of the community here to share the support my Grandpa has seen with other deserving veterans. 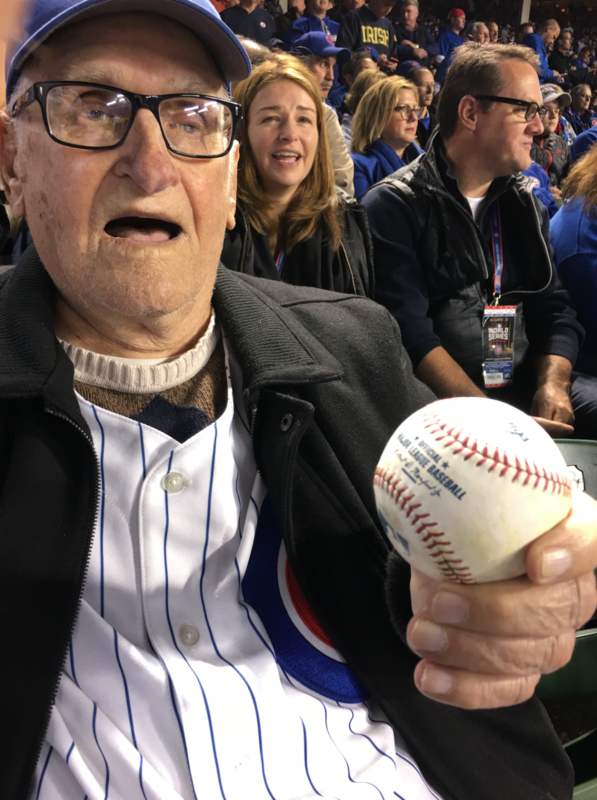 My grandpa had an amazing time at the game thanks to everyone involved. He and my dad had an amazing experience, that can't be put into words. It was unreal the support that was received for this old man. Congratulations to the Cubs too whose big win made the experience even grander! To all the generous donors of this campaign - one last thank you from me, my grandpa, and the Purple Heart Foundation. Together, we raised about $13,000 for veterans. This community has made veterans who know about the campaign know that over 500 donors stand behind them and also brings awareness to the importance of the cause. We're turning donations off to the campaign and proudly working with the foundation so they can withdraw directly. Additionally, Marcus Lemonis will be matching our total in a direct donation to the foundation as promised! There's more to be done for our vets, and if you want to keep the spirit of giving going, please share the Indiana Colt's punter Pat McAfee's campaign for vets in Indiana: https://www.gofundme.com/helpindianavets Pat will match up to $50,000 of what's donated to his own campaign! 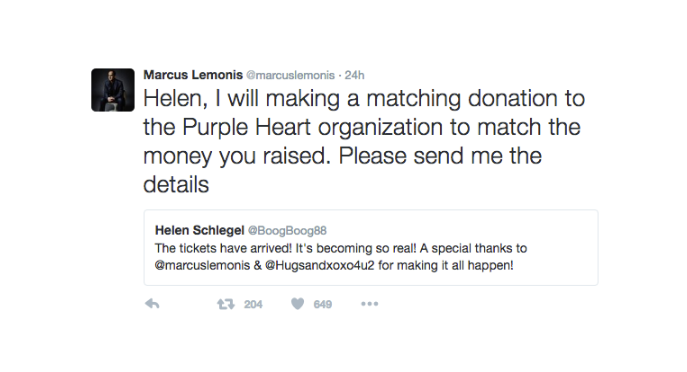 The ever generous Marcus Lemonis has pledged to match our campaign's total donation amount to the Purple Heart Foundation! My grandpa and I are thrilled to have this kind of attention and awareness being raised in honor of the veteran community. Thank you for your continued donations and support in sharing this campaign! Thank you everyone for your support. We were able to get in contact with Marcus Lemonis! He has donated 2 tickets to the game in the front row! We will be donating all the proceeds to the Purple Heart Foundation! Thanks everyone for your support and generosity! You made this happen! Thank you everyone again! Because of all your support and generosity all extra proceeds will be donated to the Purple Heart Foundation to help wounded vets! Hi....just sent this link to the Cubs organization via their website....hope someone there can help you out!!! Good luck!!! I think donating to the Purple Heart Foundation is great, but for what it's worth, I wouldn't be opposed to using the money to try to get your grandpa to as many games as you can afford! I hope you get to go to the game! Thank you for your service! Go Cubs Go! This one is for all the fans who couldn't be with us today! Thank you for your service and have the time of your life! Wonderful, wonderful news. Thanks for sharing Helen. 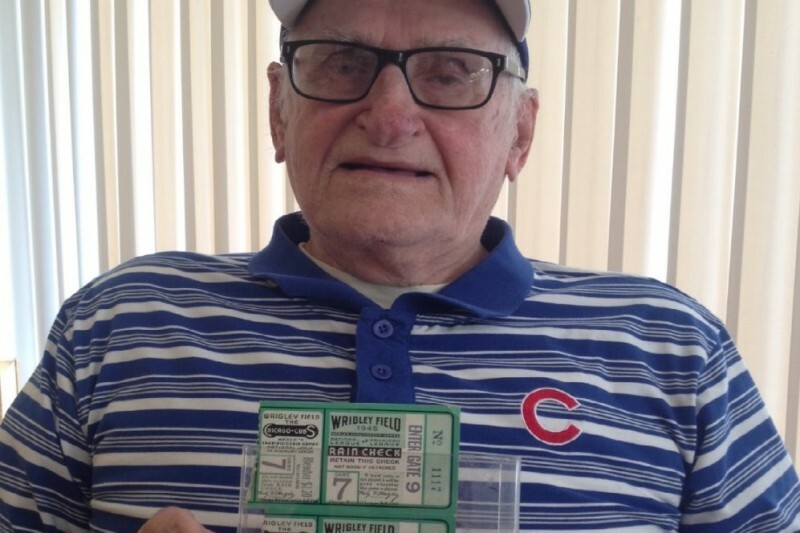 Hope its a special outing for your wonderful Grandpa, and a great game for the Cubs. Thank you Marcus Lemonis! Go Cubbies! How about a challenge to the Chicago Cubs Where are you? How about stepping up and joining the effort to support the Purple Heart Foundation in their assistance to wounded veterans and their families!! Not a bitter person at all Arlene as I wrote this i expected some to feel this way and that is your right. As it is everyone's right to give to this and not what I had talked about. It is as you say their money to do with what they want. I am by no means saying that should give to someone who is fighting for their life against impossible odds. I am merely pointing out how our society sometimes holds remedial stuff like going to a game higher than someones life. My nephew has a brain tumor which can not be removed , he has had a go fund me up for about 8 months and has gotten less than 1,000 dollars to help his family out. They have to drive 2 hours to see some of their doctors and it has been a real struggle for them and their family. So before you judge someone for putting a post up maybe you should check yourself because you know Karma may be coming up from behind you when you least expect it. If you read my whole post I said I feel for him and am glad he gets to go. A lot of it comes from how many people see the post and how many times it gets shared. I am sorry you feel that way and by no means did I come down on the person for posting this or this well deserving old man. My nephew has 5 small children with the oldest being only 10 years old. I think everyday how they all must feel dealing with the possibility of him not making it. I know it has come down to one thing or the other when it comes to finances. Some of his medication he can not get because it cost too much as well as not making doctor appointments at times. Sorry for using this to explain his situation but there are many many other in the same or similar situations that do not get the help they so desperately need. I am sorry but what a damn joke!!! I mean I have seen many Go Fund Me ads and to see one for someone to go to a damn game I mean seriously. There are a bunch that i have seen that are for people that actually need the money to help fight a disease that could possibly kill them. I feel horrible because some of them do not even come close to getting the support this man has gotten to go to a damn baseball game. I understand, the Cubs have not won one in 108 years and he himself hasn't been to one since 1945. Well there is a reason for that, they haven't been back there since then. Plenty of time to save up some cash to buy your own ticket I think. I know some are gonna get pissed because he is a 97 year old man and where is my compassion for him. Don't get wrong I feel for him and am glad he can go. It's just like I said there are so many people that really need this help to keep living or at least help their families as they try and fight something that is totally unplanned in which NO ONE is ever ready for. Believe me I am the biggest sports fan around but come on this kinda gives us a snap shot into our society and where our priorities are as humans that we would give to this but not someone that could possibly die if they can not raise the money to help pay for treatment or even gas to and from doctors. It is great that they are giving the money raised to charity since someone gave him 2 tickets. Although that is not the point it is the fact of all the people that gave to this and just skip past other one that actually mean something. I absolutely love the pic of your grandpa with the ball! I'm so glad he got to go and so glad he had a wonderful time. And thank for all you're doing to help other vets! Just wondering if he made it? Hi Helen, I was just watching ABC Nightly news and rejoiced that your grandfather will be attending the game tonight! My dad served at Pearl Harbor too. It brought tears to my eyes. I'm not a baseball fan but I want Chicago to win the series because of your grandfather. Fabulous, fabulous, fabulous!! What a wonderful story!! Have a blast, Mr Schlegel!! Sending love from Schlegel's in Maine. 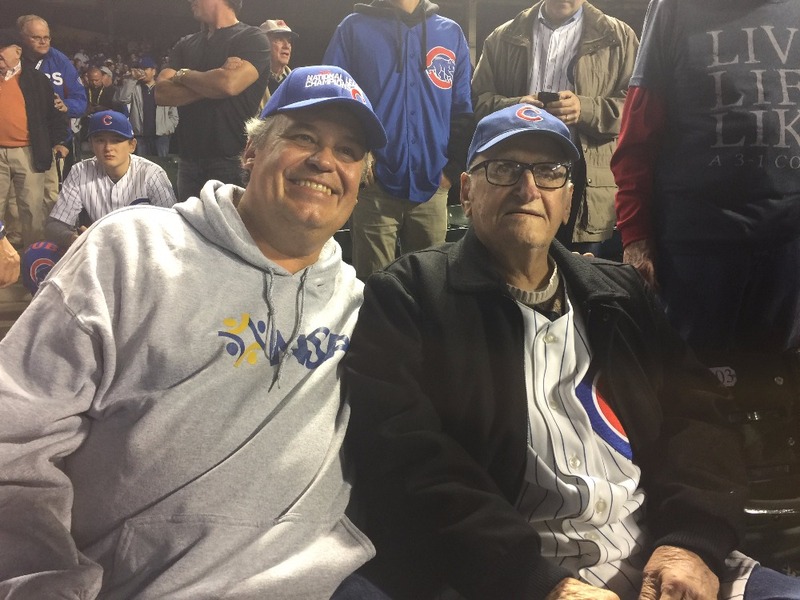 Wish my dad had made it to see the Cubs make the World Series. Have fun at the game!! Thank you so much for your service Sir! My husband was in the Navy and is also a huge Cubs fan having grown up in Chicago. He is watching every game from home in Delaware waiting to see the Cubbies go all the way! God Bless you, your grandfather and all Vets. Thank you Helen Schlegel, Marcus Lemonis and Purple Heart Foundation for what you are doing to help Veterans and their families. So happy that Mr. Schlegel is going to the game.